Traditionally, late December is a time for summarizing the past year and taking a look at what the next year might entail. Here in my blog I focus on my writing endeavors — what’s been accomplished in 2018 and what I hope work with in 2019. Q4 2018 was obviously a hectic time. When I look at the list above, I feel contented with what I achieved. Since 2014, I have planned to make a revised version of the vintage Swedish postapocalyptic RPG Wastelands, but I quickly encountered various snags and obstacles. When Tove & Anders Gillbring a few years later decided to produce Freeway Warrior as an RPG, we agreed that I would turn Wastelands into a Swedish setting for the game. My vision is best summarized as “Lars Molin meets Mad Max”. Tove’s cancer has repeatedly delayed the project, but I hope we can get it moving during 2019. The hush-hush job: I have made a deal with an publisher about a major RPG project. A non-disclosure agreement prevents me from mentioning details until the publisher has announced the venture. But I am already working on it, and the production team has had fruitful brainstorming sessions on Skype. My deadline is late 2019. Yeah, I feel good about this project. I have outlined a Traveller universe with distinctive qualities, grimmer than the one Marc Miller developed. It’s there to be written when I get time for it. It will sooner or later get published via DriveThruRPG. What rules? Well, probably one set of Cepheus Light and one set of BRP. I have outlined a dieselpunk RPG, working name Iron Empires, that takes places in an alternate timeline. The game will get at least two Terrestrial and one Martian setting. It is too early to go into details, but you’ll get updates in my blog when I have something substantial to tell. My plan is to publish Iron Empires via DriveThroughRPG, using a variant of the Cepheus Engine rules. I don’t expect to complete all these projects during 2019, but if I get sunny weather with the wind in my back, and there is plenty of coffee in my thermos flask of holding, I might walk a part of my road. However, an ancient word of wisdom cautions us: Man supposes, God disposes. I have just delivered Märk hur vår skugga …*, an introductory adventure for the new version of Chock, the upcoming Swedish horror RPG by Eloso. Ten thousand words about how young men die mysteriously in Stockholm’s finance quarters during the yuppie era of the late 1980s. I am about to venture into post-apocalyptic landscapes by writing the Swedish Wastelands setting for Åskfågeln’s Freeway Warrior. Non-disclosure agreements currently bar me from discussing other projects, but I can at least tell you that I have a few cool “RPG things” in the pipeline. 2019 will be an exciting year for me. *”Mark how our shadow…”, a quote from the well-known song Fredmans Epistel no 81 by 18th-century troubadour CM Bellman. It describes the burial of a lady acquaintance. I haven’t touched the blog for three weeks, because I have been terribly busy with my daytime job as a techwriter and with various family-related matters. However, I’m gearing up for an exciting fourth quarter. My first priority is to complete my introductory adventure to Eloso’s new Swedish horror RPG Chock. Only 20% of the text remains to be written. After that, it’s time to get going on Wastelands Sverige, a Swedish setting for Åskfågeln’s postapocalyptic RPG Freeway Warrior. My setting is based on the classic Swedish RPG Wastelands from 1991, updated to fit the 21st century. I intend to pay a lot of attention to the port city of Gothenburg and to the fertile farmlands of the adjacent province of Västergötland. And there are a few other “gamey things” in the pipeline, though my non-disclosure agreements prevent me from saying more. It looks like I’ll have an exciting 2019 when it come to writing games. I am still working on my Patreon site, and I want to get it up and running before the end of the year. As for my science fiction and fantasy novels, they are in the backburner for the time being; they have no deadlines, unlike the game texts. This summer has been extremely hot and dry here in Sweden. The unusual weather started in May and still continues two months later. Sweden’s meteorological records go back 270 years and nothing like this summer has ever been registered. The scientific underpinning of anthropogenic climate change is strong so I am convinced that mankind is heading into an era of turbulent weather. Norse mythology speaks of the Fimbulvinter, a winter that lasts for three years and heralds Ragnarök when the world will perish in storm and fire. Archaeologists speculate that this mythic winter may been a reflection of an extreme cold-weather event around AD 540, caused by volcanic eruptions. I have lived through many harsh winters so I understand my distant ancestors’ fear of that season. But these days, a Fimbulsommar appears to be a more realistic threat to my country. Warm summers are generally considered to a blessing among us Swedes, but I have endured hot Augusts in the eastern Mediterranean, in Florida and in Afghanistan, so I have come to understand how long periods of drought and heat can be regarded with as much fear as overlong winters. The Sun is not a merciful celestial entity, something that is obvious in descriptions of Apollon, a Greek Sun god who also is the lord of plague, and in the legend of Phaëthon, a demigod whose failed attempt to steer the Sun chariot across the sky almost causes the end of the world by taking the Sun too close to Earth’s surface. The warming of Terra will probably disrupt the extant political order severely as people and agriculture will have to move away from the expanding tropics. 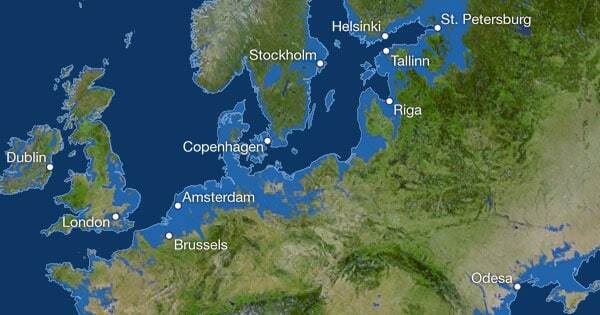 At the same time, the rising oceans will inundate major urban areas like Dhaka, London, New York and Mumbai. When I was young, science fiction stories often spoke of a future unified Earth, usually considered to be a “good thing” with humanity coming together in a union of regional “states”. Often such a unification was justified by appeals to reason, e.g., as a way ensuring peace and social stability. But the warming of Terra might instead justify a “unification by necessity” scenario: the challenges to human civilization become so huge that long-term transnational efforts are required to ensure its survival. The European Union can be seen as a case of transnational cooperation originally instigated by the necessity of avoiding yet another devastating European war. Unlike the United States, which was created by a revolutionary declaration in 1776 and by the promulgation of a constitution in 1787, the fusion of Europe’s nations (starting in 1952 with the CECA Treaty) has incrementally expanded in extent and scope, treaty by treaty. This evolution will probably never end and so I dare not guess what a united Europe will look like by the time my children, all born around the millennium, get grandchildren. — the Balkan Wars in the 1990s, and the resulting political complications, some of which remain unresolved 20 years later. — nation-building in Afghanistan after the fall of the Taliban regime in 2001/02. I went to Kabul ten years ago as a member of EUPOL Afghanistan, a civilian EU police support mission. — widespread piracy around the Horn of Africa after the internal collapse of the Republic of Somalia in the 1990s. EU has organized the long-term counter-piracy missions Atalanta and Nestor. — the spectre of resurgent European authoritarianism, also in the 2010s. The EU administration in Brussels has therefore been forced to develop central political and administrative mechanisms for crisis management. Whether those efforts have been productive is another issue, but we can at least commend the EU for trying. Going from reality to the realm of science fiction, I now envision an EU-inspired setting for an RPG setting, perhaps in 2118. Heroism in small steps might be an apt campaign theme, i.e., determined characters strive to handle minor crises that never stop coming. The loose Terran Federation (TF) is Earth’s dominating political entity. It grows slowly as sovereign nations accede to it one by one to get the full benefits of TF’s civilization-saving ventures. The TF’s tasks at hand are immense because agriculture must be reorganized at the continental level and new cities built at Earth’s new coastlines. Its Crisis Investigation Center (CIC) dispatches intrepid operators to trouble-spots around the world. Their job is to check what is really going on and figure out what to do about it, their conclusions sometimes leading to the establishment of specialized operations for handling specific problems. But serving as an field operative of a cumbersome organization is never a smooth ride; in this particular context, CIC agents often need to come up with creative solutions that accomplish what’s needed, while keeping the home office in a state of semi-ignorant complacency. When hotshot freewheelers, for example the militant activists of the Emerald Serenity movement, jump into the fray, the situation of the ground gets even more messy. Voilà, I have moved from my reflections on this extreme Swedish summer to outlining a setting for a semi-near-future science fiction campaign based on a very troubled Earth, executed as “green cyberpunk”. And that’s the core of this post: a piece of political science fiction inspired by the current grim climate changes. Summary in English: I explain why and how I these days write settings for Swedish roleplaying games. Eftersom jag inte livnär mig på att skriva rollspel nuförtiden — det skulle jag gärna göra men Sverige är inte längre som hon var 1985-89 — så skriver jag bara produkter som engagerar mig. Skymningshavets gåtor till Drakar och Demoner 2016 är ett exempel: en setting som jag hade längtat i åratal om att få göra och äntligen fick jag chansen. Detsamma gäller rebooten av Wastelands till Åskfågelns Freeway Warrior: som idé har den funnits i min pipeline i fyra år och äntligen har jag hittat ett sammanhang där jag kan återvända till en av mina favoriter med några varsamma uppdateringar (jag skrev WL 1.0 i början av 1990 och dåtidens Sverige fungerade delvis annorlunda än dagens). Alltså, för att gå rakt på sak, jag rebootar mina gamla settingar därför att det roar mig. Om jag kunde skulle jag återvända till fler, men ofta är det omöjligt av rättighetsskäl. Tove & Anders Gillbring och jag kom strax före jul överens om att jag rebootar Wastelands som en svensk kampanjbok till Åskfågelns rollspel Freeway Warrior. Prelimnärt producerar jag boken under 2018 så att den kan publiceras 2019. Vi är i Sverige efter katastrofen: Slitna läderjackor, timmerpalissader, buckliga Volvos, älgragu & halstrad abborre, barrskog, lera och ruskväder. Livet är hårt: Varje dag är en kamp. Ha därför koll på ammunition och matransoner. ”Makten sitter i spjutstångs ände”: Fria människor bär alltid vapen om så bara en kniv; endast trälar är vapenlösa. Vrålande motorer: Bilar och motorcyklar är lika väsentliga här som hästar i en westernfilm. Horisonten är nära: Folk vet vad som händer i hemtrakten, men vad som sker bortom länsgränsen är illa känt. Patriarkatet är utdött: Gamla tiders kvinnosyn försvann vid Undergången. Kvinnor och män står numera helt och fullt sida vid sida i kampen för överlevnad.